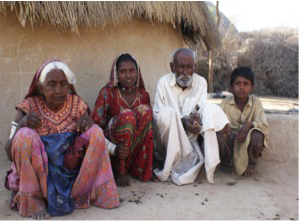 Ninety-two-year-old Anchlo, standing in front of his straw and mud home, describes his experience when a severe drought swept across his village in Pakistan. 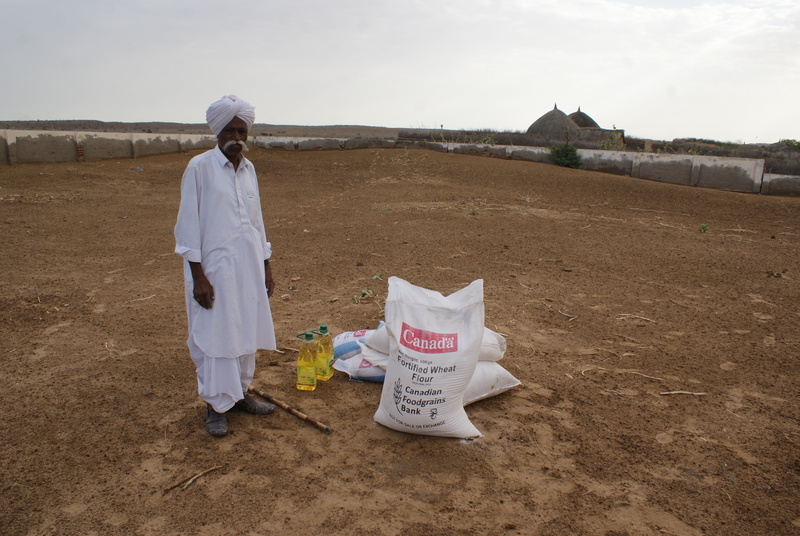 The dry weather destroyed basic grain crops on his farm, leaving Anchlo and his family without their major source of food and income. But even before the drought, he was having trouble making ends meet. When their daughter and son-in-law passed away, Anchlo and his wife Mano took in their three grandchildren. Anchlo started cutting and selling wood in a village nearby to earn extra money. But his meagre wages were just barely enough to put food on the table. “Our situation was never good but it got even worse when the drought knocked on our door,” he shares. When the dry weather persisted, Anchlo began to worry about his family’s future. In response to the drought, Presbyterian World Service & Development’s local partner Community World Service Asia, with additional support from Canadian Foodgrains Bank, provided emergency food packages to meet the nutritional needs of families affected by the drought until they could harvest their own fields. Anchlo’s family is just one of the many others in his community who received foods like flour, legumes, oil and salt. The distributions helped ensure that the families’ immediate food needs were met. Food assistance was provided to over 10,000 people (1,800 families) during the seven months of the response. Anchlo is now optimistic as he waits for the rains that will revive his plot of land. Through your generous support, people are receiving the assistance they need to feed their families today and for the future. Make a donation today.